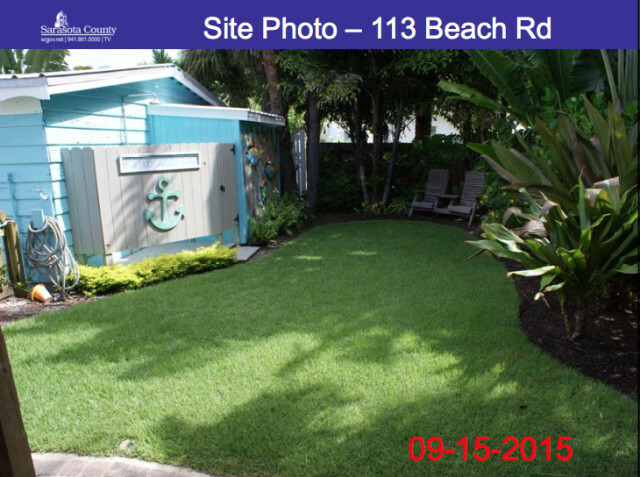 It took slightly more than 30 minutes for the Sarasota County Commission this week to unanimously approve a coastal setback variance for the construction of a backyard pool on Siesta Key. Most of the board members’ discussion focused on frustrations regarding precedence, consistency and the desire to avoid legal challenges after they approve such construction. They also debated revising the county’s Coastal Setback Code, though a senior staff member cautioned that could result lead to more problems. 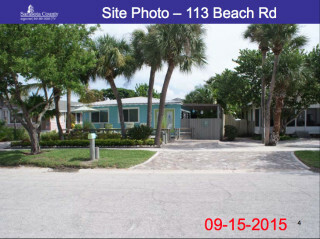 The focus of attention during the commission’s regular meeting on Feb. 17 in Sarasota was the fact that the 200-square-foot pool at 113 Beach Road would be seaward of the county’s Gulf Beach Setback Line (GBSL). 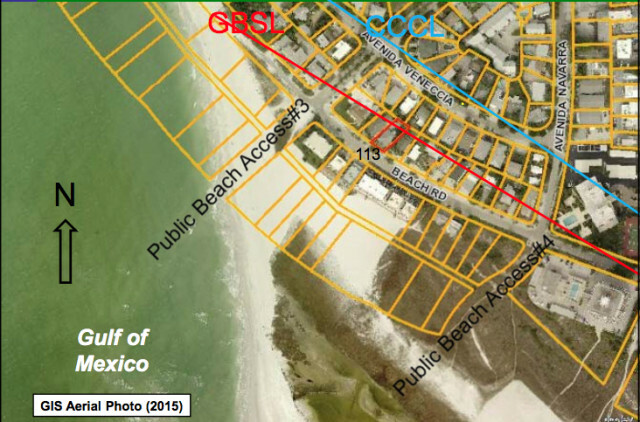 Weiqi Lin, a county coastal engineer, made clear in his presentation that the petitioners’ house is located across Beach Road from another building — Siesta Sands on the Beach — that fronts on the Gulf of Mexico. The pool would be constructed on pilings, he added, and it would be 619.8 feet landward of the current Mean High Water Line. The backyard of the house is “landscaped without any native plants and native habitats,” a Feb. 17 staff memo notes. The coastal setback variance petition formally was made by RGM Properties LLC. The owners of the property are Robert and Gay Moxley of Osprey, who bought the home in September 2013 for $610,000, according to Sarasota County Property Appraiser’s Office records. The house was built in 1940, the records say. 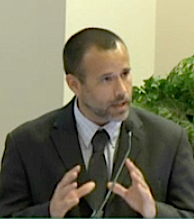 Matt Osterhoudt, senior manager in the county’s Planning and Development Services Department, told the board members that each petition for a coastal setback variance “should be taken into consideration by itself.” The board needs to consider the proximity of the property to features of the coastline and other infrastructure, he added. Projects “are particular to the land” on which they are proposed, he said. The staff report provided to the board explained that the house at 113 Beach Road is a one-story structure, slab-on-grade, that has 1,116 square feet of space. A detached garage also sits on the parcel, landward of the residence, though it is partially seaward of the GBSL, the report notes. 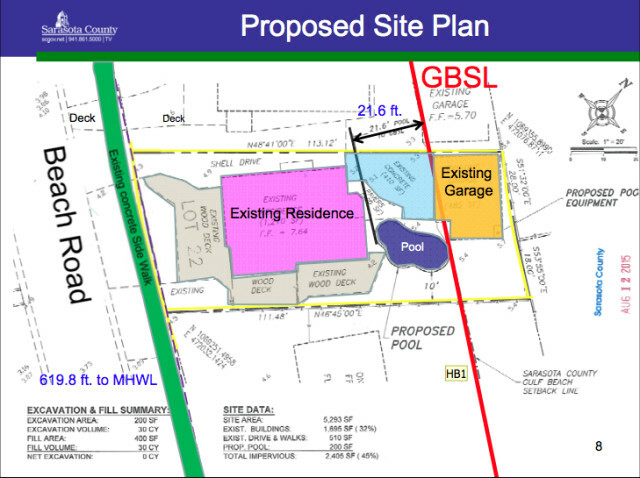 The pool would be an “ancillary feature to a property and the County Commission … may find that it does not meet the variance approval criteria associated with ‘minimum variance necessary for reasonable use of the property,’” the staff report adds. Furthermore, Shannon pointed out, Florida Department of Environmental Protection (FDEP) staff already had indicated it would issue a permit for the construction. All that Shannon needed before that could take place, he said, was for the County Commission to approve the variance. With no speakers signed up for the public hearing on the matter, Chair Al Maio asked for a motion. Vice Chair Paul Caragiulo offered one that would approve the petition. After Maio sought a second, silence ensued for a couple of minutes. Then Maio seconded the motion. 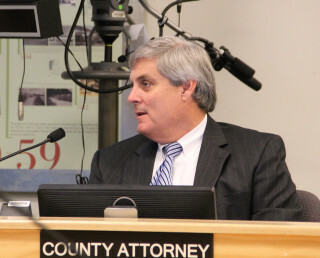 Then Commissioner Christine Robinson asked County Attorney Stephen DeMarsh about an earlier petition the board approved for a pool on Siesta Key, on the Gulf of Mexico side of the road. The site of that proposed construction was adjacent to a condominium complex that extended well seaward of the planned location of the pool, she added. After the board granted that request, she continued, “We were slapped down pretty hard” by a judge, following a legal challenge brought against the commission over its decision. 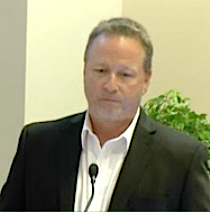 DeMarsh explained that the court based its ruling on the criteria the county employs for granting coastal setback variances, as well as the record set forth during the public hearing on the matter. In that case, DeMarsh continued, the court found that the pool, as an ancillary structure, was not necessary for the petitioners to attain the minimum allowable use of the property. “Since that happened,” Robinson said, “I’ve been pretty consistent on the pool issue” whenever such variance requests have come before the board. DeMarsh then pointed to the facts pertaining to the petition at hand. Because this case involves construction on the landward side of Beach Road, he explained, “factually, it’s very distinct” from the one Robinson referenced. Hines voiced concern that if the board approved this petition, people from Casey and Manasota keys, whose petitions to build pools had been denied by the board, would “come running in here” to say the commissioners were wrong in their cases. That was all the more reason, Hines said, that he was searching for an easier way to achieve consistency in the board’s decisions on these types of petitions. Hines reiterated that the Moxleys’ pool would be landward of Beach Road. “It’s not really a life and health and safety issue,” he added, whereas allowing construction of a house seaward of the GBSL could be more problematic. When the board sought a fuller explanation about “ancillary” structures, Howard Berna, the county’s environmental permitting manager, said staff uses the term to indicate structures other than a primary residence, such as detached garages, gazebos and tiki huts, for example. In the Moxleys’ case, he said, it appears an opportunity exists to move the pool further landward, though that would put it some distance from the deck on the back of the house. Berna added that he did not know whether the shift in placement would be permissible under the setback code. “It comes down to the minimum variance necessary for the reasonable use of the property,” Berna explained. DeMarsh also noted criteria provided by staff for the board to consider in this situation. After that discussion, Hines told his colleagues he would support Caragiulo’s motion, stressing that Beach Road and another building would be between the pool and the Gulf of Mexico. Robinson still had concerns about the prior court case, though. DeMarsh also explained that if a legal challenge arose in this case, the court would look at the record made during this public hearing. In the earlier case, he noted, “the court did not seek to re-weigh the evidence” presented during the public hearing held before that variance was granted. Finally, Maio closed the public hearing. The vote was 4-0 in favor of the variance.